FORT MYERS, Fla. -- This is the kind of move guaranteed to make the Yankees nervous, especially because they had Wily Mo Pena first. 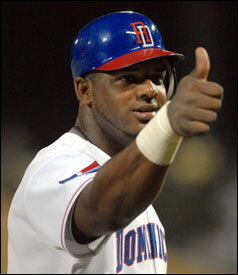 They know better than most that David Ortiz isn't exaggerating when he says Wily Mo hits the ball harder than anyone, ''including me," and that Pena's Reds teammate, Rich Aurilia, who used to play with one Barry Bonds, says he has never seen anyone hit the ball so hard. The stories are legion, and one of them took place right under the Yankees' noses, before an exhibition game against the Reds in Tampa. ''Wily Mo was taking batting practice, and everybody came out to watch -- Ken Griffey Jr., everybody," a scout who was there said yesterday. ''The balls he hit were still rising as they cleared that big scoreboard in center field in Legends Field. He has as big a power as anybody in the game." Last season in St. Louis, the righthanded-hitting Pena hit a ball that traveled an estimated 492 feet, the longest ever by a Cardinals opponent. He hit two home runs, including a walkoff three-run blast, on Wily Mo Pena Bobblehead Night in Cincinnati. Filling in for an injured Griffey in 2004, he hit six home runs in a span of eight games, and last spring he took Randy Johnson deep in an exhibition game. ''I'm telling you one thing, I've seen that man hit some balls in the minor leagues that were McGwire-like," said Mike Easler, the former Reds hitting coach who is now a minor league hitting coach for the Dodgers. ''A great kid, too. Lots of enthusiasm. I don't want to tell other teams how to pitch him, but that ballpark is going to be great for him. ''And he's going to be around Manny, Big Papi. I just think it's a good move for Boston. And remember: The man is still just a baby. This man is ready to play some ball now." So why did the Yankees give up on this 245-pound strongman less than two months after his 19th birthday, trading him to the Reds in 2001 for Drew Henson and Michael Coleman, the one-time Sox prospect self-dubbed ''Prime Time" until he ran out of time? Part of it is that they gave him a five-year, $3.75 million big-league contract as a 17-year-old, after the commissioner's office ruled that the Mets and Marlins had both signed him illegally. Even then, he was big (6 feet 3 inches), and his growth plates had not closed yet, the Yankees figuring he would be huge by the time nature took its full course. The contract was salvation for the son of a poor tobacco and rice farmer in Laguna Salada in the Dominican Republic, a kid who grew up sharing a bed with his brother, but it proved a detriment to his development as a player. Giving such a young kid a big-league contract meant, by baseball's option rules, that the team would have to keep him in the majors long before he was ready. A perennial contender like the Yankees could not afford to give up a roster spot to such a raw talent, so they shipped him off to the Reds. They might never admit it publicly, but you'll find people in the Yanks' office who say they made a mistake giving him that contract. What Pena needed was to play every day in the minors for a couple more years. Instead, the Reds had to keep him on the big-league roster starting in 2003 or risk losing him on waivers, and the results weren't pretty. He batted .218 and struck out 53 times in 165 at-bats in 2003, almost once every three at-bats. Since then, there have been some big-time flashes -- 45 home runs in 647 at-bats as a part-timer the past two seasons -- but there were also moments like last June in Fenway Park, when Sox fans saw Pena at his rawest. In 10 at-bats, he whiffed seven times, including five times in succession. It was even worse in right field. Pena, approaching the Pesky Pole as if it were electrified, banged into the railing as he tracked Manny Ramirez's fly, jarring the ball loose -- out of his glove and into the stands for the easiet home run Manny had all season. He also lost an Edgar Renteria liner in the lights, and played a David Ortiz corner-carom into another double. Oh, and on the bases, he was thrown out at second as he styled his way around the bases after hitting a ball off the Wall. You understand, then, why Sox general manager Theo Epstein, who parted with Bronson Arroyo to get Pena yesterday, terms him a work-in-progress. He is still just 24 years old. The last time the Sox added a part-time player with Pena's power potential was when they signed a nontendered Ortiz, 27, to back up Jeremy Giambi at first base. We all know how that worked out. Pena, who played with Ortiz on the Dominican entry in the World Baseball Classic, was looking forward to this being his breakout year in Cincinnati. With the Reds having traded Sean Casey to the Pirates and moved Adam Dunn to first base, he was penciled in to play left field every day. In Boston, he's back to a time-sharing proposition with Trot Nixon in right field, and can also play center field, though two scouts said yesterday that as Pena has added 30 pounds in muscle, he has regressed defensively and doesn't run as well. His agent, Jay Alou Jr., says he also can play some first base, but no one's really convinced of that. ''We need a hitter," said one National League scout, ''but we weren't on him at all. Too many swings and misses, lots of holes, and he's gotten worse defensively." But in Arroyo, the Sox had a chip that allowed them to take a gamble. Arroyo would have started the season in the bullpen, and while he was young and healthy in a rotation that is old and has physical issues, the Sox have Jonathan Papelbon and Jon Lester in the pipeline. They have no such equivalent bopper in the system. ''I just hope something happens where he gets to play every day," said Alou, who was driving Pena from Reds camp in Sarasota to Fort Myers last night. ''He can't sit again. He plays, this guy can hit 40-50 home runs." That's not just agent talk, said one major league executive who happens to like Arroyo very much. ''I don't really see him being a Red Sox type player -- [Pena has] lots of whiffs, very few walks -- but he's a very interesting guy," the executive said. ''Let him play, and he's going to hit a lot of balls into the seats." If he sits, the Sox are risking having another Jay Payton on their hands, which led to the ugliness in Texas last year in which Payton openly challenged Francona. There was already a rumor circulating last night that Washingon GM Jim Bowden, who made the trade that brought Pena to the Reds from the Yankees, might try to get the Sox to flip Pena for Alfonso Soriano, who refused to play left field for the Nats last night (Bowden, rumor has it, also would love Manny if the Sox paid some of the money). Undoubtedly, the Sox will counsel patience with Pena. If he is the player they believe he is, and with Nixon at the end of his contract, they may have their right fielder of the future, an impact player at that. Too bad he has to use a glove. Did the Sox do Arroyo wrong?